Fig. 2.3.3. Chromatogram of quaternary alkylammonium compounds. Columna, Shodex Asahipak GF-310 HQ (100 X 4.6 mm2); mobile-phase, 0.4 mM 4,4'bipyridyl, 0.8 mM HCl, 27% (m/v) acetonitrile; flow rate 0.6 ml min-1; analyte concentration 1.0 mM; injection loop, 50 mL. Reprinted with permission from Ref. © 1999 Elsevier. surfactants produced at the industrial scale have large numbers of impurities, and represent a polydisperse mixture of compounds with different lengths of ethylene oxide chains approaching Poisson distribution of different oligomers. Using a normal-phase separation mechanism on polar or moderately polar supports (silica, CN modified silica, NH2 modified silica, diol, and methylated silica), polyethoxylated surfactants can be separated according to the length of the ethylene oxide chain. On the other side, reversed-phase chromatography on non-polar supports (C1, C2, C8, C18, polyethylene-coated silica or alumina) is apparently unsuitable for the separation of different oligomers, because of its large selectivity towards alkyl groups. However, this technique is particularly suitable for the separation of surfactants containing various hydrophobic moieties (homologue-by-homologue separation), and according to both the alkyl and polyethoxy chain lengths and side products (polyethylene glycols). Separation of APEO has been attempted using both normal-phase and reversed-phase systems combined with absorption or fluorescence detection. In the normal-phase system, the APEOs are separated according to increasing number of ethylene oxide units, while corresponding oligomers with the same number of ethoxy units but different alkyl substituents co-elute, as shown in Fig. 2.3.4 for NPEO and OPEO and in Fig. 2.3.5 for NP and OP . This approach usually employs polar or moderately polar supports, such as bare silica gel, amino- or cyano-bonded silica, diol columns, methylated silica support (C1) or alumina. As industrial APEO blends usually contain a wide distribution of ethoxy units, they can be successfully separated only by using binary or ternary gradient elution, while isocratic separation is successful over a limited oligomer range. By variation of the composition of the mobilephase, it is possible to extend the range of oligomers that can be determined (up to 25 mol adducts). The information about the exact distribution of individual oligomers in an environmental extract is rather important, since it permits identification of the major source of APEOs, as well as assessment of the degree of degradation of the parent surfactant. Fig. 2.3.4. 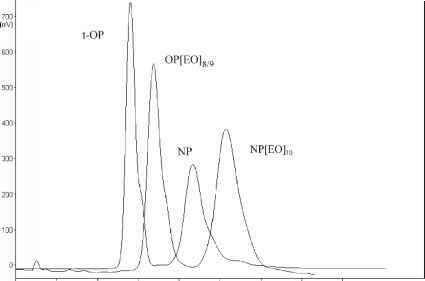 Normal-phase chromatograms of commercial mixtures of alkylphenol ethoxylates: (a) OP[EO]8/9; (b) NP[EO]2; (c) NP[EO]4; (d) NP[EO]10. Column: 100 X 4.6 mm2 Hypersil 3 NH2 (3 mm), gradient elution with re-hexane-2-propanol-H2O, detection: fluorescence, excitation 230 nm, emission 290 nm. Fig. 2.3.5. 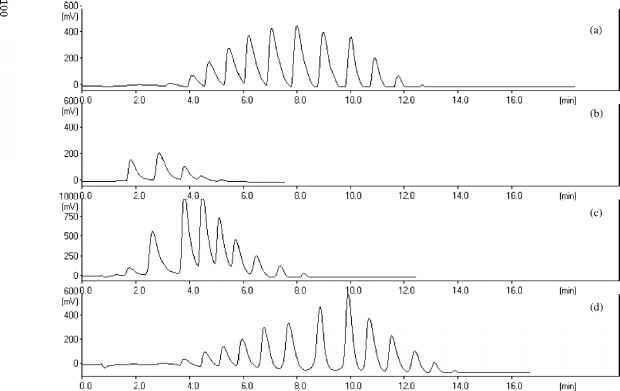 Normal-phase HPLC chromatograms of commercial standards of (b) t-octylphenol and (a) 4-nonylphenol (85%). Column: 100 X 4.6 mm2 Hypersil 3 NH2 (3 mm), gradient elution with n-hexane-2-propanol-H2O, detection: fluorescence, excitation 230 nm, emission 290 nm. silica [65,66], silica  or diol columns  were also employed for the analysis of NPEOs in wastewaters or in technical blends. Zhou et al. used a diol column and UV detection at 275 nm for the determination of NPEOs in industrial blends achieving detection limits of 50-130 ng (absolute value) of individual NPEOs. Reported detection limits using NP-HPLC and UV are generally in the range of 0.55 mg L-1 for an individual NPEO [59,69]. Although the UV absorbance detector is widely used for the detection of NPEOs, much higher sensitivity and better selectivity could be achieved with a fluorescence detector. The application of fluorescence detection also provides a significant improvement with respect to the detection of NP1EO and NP2EO in the presence of early eluting compounds of lower polarity, such as PAHs and phthalates . Fluorescence detection at wavelengths of 225-230 nm (excitation) and 290-310 nm (emission) gave detection limits of individual oligomers below the mgL 1 level. For example, Bennie et al. reported a detection limit of 0.02 mg L-1 for NP1EO and NP2EO in river water, while Ahel et al. reported a determination limit (S/N = 10) for an individual oligomer in the range of 0.2-0.6 mgL-1, depending on its response factor (RF). The authors showed that relative RF (relative to RF of NP1EO = 1) of individual oligomers increase linearly with increasing number of ethoxy groups. They were determined by quantifying the exact composition of commercial mixtures of NPEOs using 2,4,6-trimethylphenol or 4-t-butylphenol, respectively, as internal standards and then calculating individual response factors . of APEOs and LAS using an elution gradient with acetonitrile and water-containing NaClO4 , and for simultaneous determination of their corresponding degradation products (NPEC and SPC) using fluorometric detection (225 nm excitation and 295 nm emission) . Alcohol ethoxylates (AEOs) and poly(ethylene glycol)s (PEGs) Aliphatic AEOs, considered as environmentally safe surfactants, are the most extensively used non-ionic surfactants. The commercial mixtures consist of homologues with an even number of carbon atoms ranging typically from 12 to 18 or of a mixture of even-odd linear and a-substituted alkyl chains with 11-15 carbons. Furthermore, each homologue shows an ethoxymer distribution accounting typically for 1-30 ethoxy units with an average ethoxylation number in the range 5 - 15. 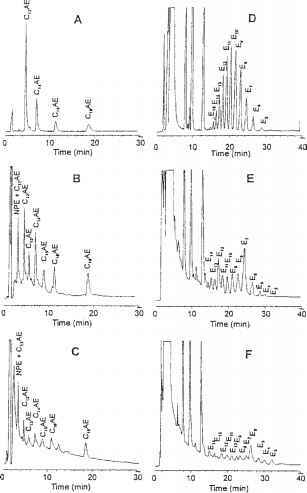 The separation of the AEO complex mixtures was achieved by reversed-phase and normal-phase chromatographic systems [74-76]. Fig. 2.3.7. Overlay of reversed-phase HPLC chromatograms of branched and linear octylphenol, and NP[EO]9. Column: 125 X 4 mm2 Lichrospher RP-18 (5 mm), isocratic elution 1.0 mL min-1, mobile-phase 8:2 (v/v) methanol/water. While the alkyl chain distribution is determined on a non-polar RP8 and RP18, EO homologue distribution is determined using a polar phase. AEOs are not UV-absorbing species, so they cannot be directly determined by HPLC followed by standard optical detection systems (UV and FL), unless suitable derivatives are prepared . Because of this, methods based on liquid chromatography-mass spectrometry [77-79] are currently considered as the benchmark procedure that gives sufficiently high selectivity and sensitivity. procedures for the routine determination of AEOs and PEGs in aqueous environmental samples. The AEO derivatives were separated into homologue-by-homologue and ethoxymer-by-ethoxymer by reversed-phase HPLC-fluorescence after derivatisation with naphthyl isocyanate and naphthoyl chloride, respectively. The ethoxymer-by-ethoxymer separation of PEGs was obtained by RP-HPLC-FL after derivatisation with naphthoyl chloride. The chromatograms of the naphthyl isocyanate derivatives of AEOs and NPEOs, and the naphthoyl chloride derivatives of PEGs in the influent, and final effluent of a sewage treatment plant are shown in Fig. 2.3.8. Kiewiet et al. used phenyl isocyanate for the derivatisation of C12EO-C18EO in raw influents, settled influents and effluents of seven WWTP in the Netherlands, while Heining et al. used the same method for 'fingerprinting' of technical products and household formulations. These derivatisation procedures have been shown to be suitable for the analysis of real-world samples, providing information on alkyl and/or ethoxylate distribution, but still lack the appropriate sensitivity. The sensitivity of these techniques is rather low, 5-10 ng of injected AEOs and PEGs (5 mgL"1 for the pre-concentration of 1 L samples) using naphthyl isocyanate and naphthoyl chloride, and 3 mg L"1 using phenyl isocyanate (pre-concentration of 4.7 L of WWTP samples). Refractometric  and ELSD [85,87] are alternative methods, which do not require derivatisation of AEOs. A differential refractometric detector was applied to simultaneously analyse mixtures of AEOs and an anionic surfactant (sodium dodecyl-sulphate (SDS)) in water using ion-pair reversed-phase HPLC . 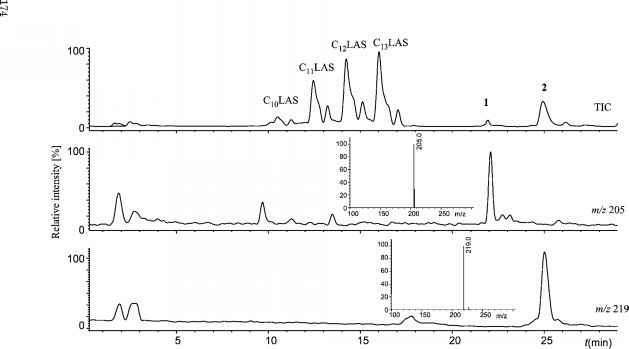 Eluents containing 55% acetonitrile in water with tetraethylammo-nium as the ion-pairing reagent and NaCl allowed reproducible separation of SDS and polydisperse C12EO surfactant mixtures on a C8 column (chromatogram shown in Fig. 2.3.9). The disadvantages of this detection method are baseline drift when solvent gradients are used and their quite high detection limit. Fig. 2.3.8. 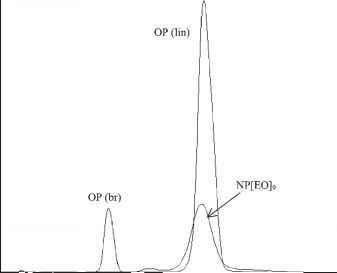 Chromatogram of the NIC derivatives of oleochemical AEOs in a standard solution (a); AEOs and NPEOs in extracts of the influent (b) and final effluent (c) of a sewage treatment plant. 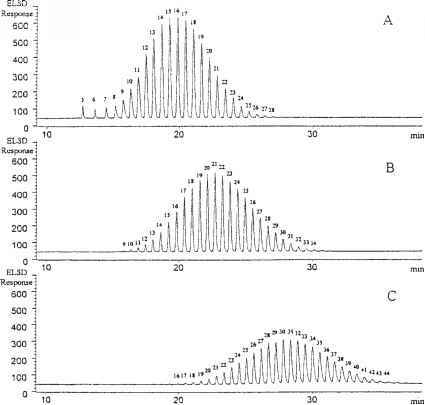 Chromatogram of the NC derivatives of PEGs in a standard solution (d); and extracts of the influent (e) and final effluent (f). Stationary phase: C18 column; mobile-phase: methanol-acetonitrile (a)-(c) and acetonitrile-water (d)-(f). Reprinted with permission from Ref. © 1996 Elsevier. Fig. 2.3.9. 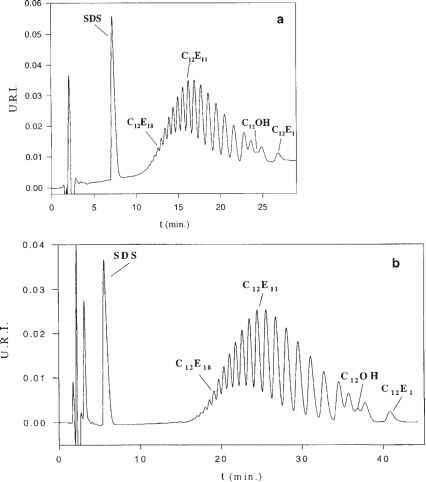 Analysis of a mixture of SDS (0.2 g LT1) and C12EU (2 g LT1) on C Ultraspher column (250 X 4.6 mm2, d 5 mm) under the following operating conditions: (a) mobilephase CH3CN-water (58:42, v/v) + (C3H7)NBr 2 X 10-2 mol L_1 NaCl 4 X 10 mol L-1, flow-rate 1.12mLmin_1 and temperature 29°C; (b) mobile-phase CH3CN-water (55:45, v/v) + (C3H7)NBr 5 X 10 mol L2 + NaCl 10-2 mol L-1, flow-rate 1 mL min-1 and temperature 26°C. Reprinted with permission from Ref. © 2000 Elsevier. Fig. 2.3.10. Separation of pure-hydrophobe ethoxylated dodecyl alcohol surfactants. (a) C12E15.3 (867 mg L-1); (b) C12E20.6 (859 mg L-1); and (c) C12E30.0 (861 mg L-1). ELSD detection for all chromatograms. Reprinted with permission from Ref. © 1996 Elsevier. with numbers of EO groups ranging from 3 to 50. Figure 2.3.10(a)-(c) shows separation of several pure-hydrophobe ethoxylated dodecyl alcohol surfactants, demonstrating the wide range of applicability of this method. Native PEGs represent a rather difficult class of compounds for either RP-HPLC or NP-HPLC due to their high polarity . On polar stationary phases (silica, diol, CN, aminopropyl) they are very strongly retained and strong solvents like methanol or ethanol are needed to elute them. However, such an elution leads to very poor resolution of individual oligomers, which usually elute in one single peak. In contrast, for hydrophobic sorbents (C8 and Ci8) the retention of these polar compounds is very weak. Despite this apparent drawback, several HPLC methods were proposed and excellent separation of PEG oligomers were reported . Octadecyl silica and poly(styrene-divinylbenzene) were found to be well suited as a stationary phase in reversed-phase HPLC separation offatty acid mono- and diethanol amides (FAMA and FADA). Using methanol-water mobile-phase homologues containing C10-C18 alkyl groups were eluted, according to the increasing alkyl chain length. These compounds, widely used as foam boosters and foam stabilisers in liquid detergents and cosmetic products, can be detected using UV (210 nm), refractive index or nitrogen-specific chemiluminescence detection . Ethoxylated alkyl amines in pesticide formulations were separated using two different columns: a cyano-modified silica column to determine the alkyl distribution and an amino-modified column to determine the ethylene oxide distribution . The detection, specific for ethoxylated amine, was performed with a post-column ion-pair extraction system and fluorescence detection. Commercial alkyl polyglycosides (APGs) are complex mixtures of alkyl homologues, oligomers of different hydrophilic sugar moiety, anomers (a- and b-anomeric forms with respect to the bonding between the sugar and the alkyl chain) and isomers (furanosides and pyrano-sides). Isocratic RP-HPLC, combined with an ELSD, has proven to be a reliable method that allows monitoring of the kinetics of alkyl glycoside synthesis, which includes simultaneous monitoring of the initial carbohydrate and the surfactant formed . 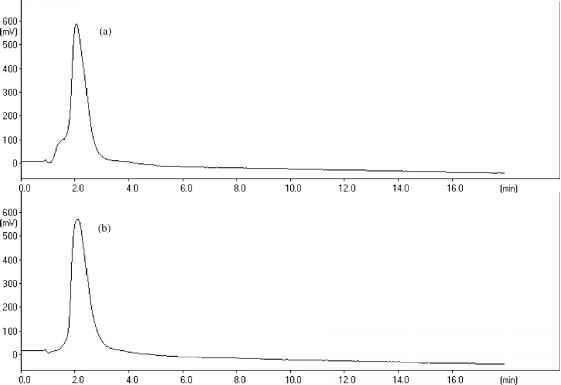 An HPLC method using C8 column and an eluent mixture of water/acetonitrile (60:40, v/v) was able to detect 30 ppm APG using an RI detector, while in simultaneous UV detection a detection threshold of 100 ppm was achieved . Gradient elution RP-HPLC allows the separation of APGs according to their alkyl chain length and simultaneous separation of alkyl ethoxy glucosides with regard to the length of the ethoxy chain. NP-HPLC with isooctane-ethyl acetate-2-propanol in the gradient mode allows the separation of alkyl glycosides into a- and b-anomers . LC with conventional detectors (e.g. UV and fluorescence detection systems) has been extensively used for the separation and quantitative determination of ionic and non-ionic surfactants in both industrial products and various environmental samples. This method is a readily available technique in many laboratories and has proved to be a versatile technique directly applicable to different surfactants with a chromophore group and to their degradation products. However, the application of UV or FL detectors in the analysis of fatty acids, fatty alcohol derivatives, as well as some cationic surfactants, requires a time-consuming derivatisation step prior to LC analysis. Furthermore, the complexity of surfactant mixtures consisting of various isomers, homologues and oligomers and the lack of reference standards limit the applicability of conventional detectors. For the analysis of complex environmental samples, the LC technique using conventional detectors is often unsuitable for trace level determination due to low sensitivity and lack of selectivity. Co-elution of interfering matrix components may additionally hamper the accurate quantification of target compounds. At present, within modern analytical techniques, only GC and LC combined with MS and tandem MS, respectively, provide sufficient selectivity and inherent sensitivity in analysing surfactants in complex samples.